Anchors can get jammed under rocks, stuck under heavy chains, or can get entangled in discarded netting. Especially volcanic seabed is prone to grapple all types of anchors. 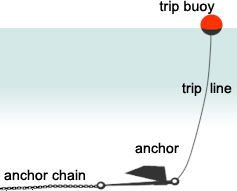 Therefore a tripline is often required to retrieve the anchor. The image shows the proper use of a tripline - connected to tripping ring on one side and a floating buoy on the other side. The tripline should only be a few metres longer than the depth, or one could use a counterweight to keep the line taut. The line should be strong enough to lift the anchor using an (anchor)winch. Do not use a tripline in a location where it can foul the props of other yachts, (the entrance) of a port for instance. Once the anchor is adequatly dug in, attaching a bridle or snubber (indicated in red) to the anchor rode will create a sacrificial layer and reduces strain on the bow roller and winch. It also reduces swaying and yawing and the noise of the chain. 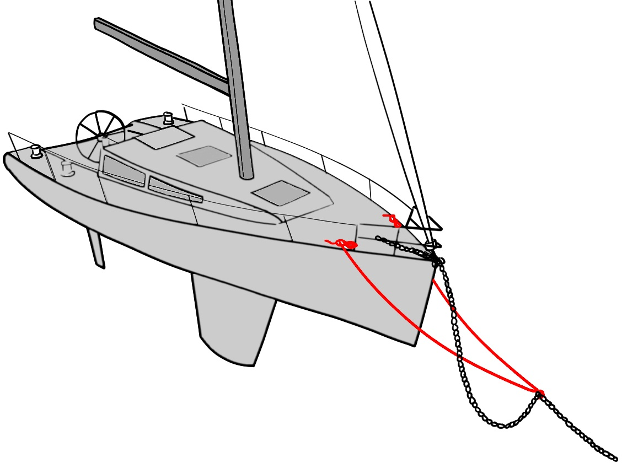 On charter yachts the second anchor (often deployed at the stern as illustrated below) has a combination rode (a line or rope + a few metres of chain) instead of a full chain rode. The weight of this section of chain allows for a horizontal force (pulling along the seabed) instead of pulling partly vertical which would hamper the grip of the anchor. get a catenary effect that improves the dampening, like a snubber on an all-chain rode. keep the rode away from other boats and propellors. keep the rode from wrapping your keel/rudder/prop in light winds or shifting currents. Better holding should be achieved with a full chain rode, with a heavier chain and a heavier anchor. In other words: the primary anchor. The kellet is therefore typically used in light winds or only with the second anchor. A longer rode - whether chain or line - is always better. Ideally there are enough crew members to set up a watch system for 1½ hour watches, or shorter. The most stressful and difficult watches (tidal or weather change, moonset) should be filled by the most experienced persons. If the skipper expects to get woken ever now and then, he/she is best left out of the roster. Keep the engine key at a standard place at hand. Keep a search light at hand. Write down the order of crew members and their wake-up times. Make sure the skipper is woken even when in doubt. Wear a life jacket outside the safety of the cockpit. see my chapter 10 of my navigation course. Other boats at anchor. If possible, anchor away from other boats. If the anchorage is too crowded to permit that, well, you're beyond the scope of this course, but try to anchor near boats that are similar to yours. For example, a keelboat is much more influenced by currents than say a powerboat with its shallow draft. Powerboats instead tend to swing with the wind. Of course, in the absence of current, the keelboat will also swing with the wind. Assess how boats will swing on their anchors if conditions change. Your boat will swing in a circle whose radius is, to a first approximation, the length of the rode you have out plus the length of your boat. The swing circle for other boats is found in the same manner. You'd like to be further away than your swing radius from the swing circle of any other boat.